In the past, post-Frozen but pre-“Skin Deep”, Sir Maurice’s castle is under siege by ogres. Mrs. Maurice (Wiki tells me her name is Colette) is in the library, flinging books around in an effort to save them, or confuse the ogres, or something. The castle guards want her to leave but Books represent her entire personality. Just kidding, she is also a Mom. Belle runs over with a book of her own to save but before they can escape an ogre is stomping all over the library. They hide under the table because ogres are dumb I guess, except apparently not that dumb cuz the ogre finds them. Belle doesn’t remember what happened after that but RIP Colette. Last week (last night on screen) Emma and Hook found video proof that Another Snow Queen was Teen Emma’s foster mom. Naturally they call a meeting of minds at the Sheriff’s Office. Snow: You were such a cute baby. Snow: This is the closest I’ve gotten to watching you grow up and I’m still a little bitter so work with me, okay? Emma: Point is I don’t remember any of this. Regina: That is a mystery. Emma: Which is why I called this meeting. Snow: What did she want with my baby? Elsa: How did she even get here? Emma: That is why I included Mr. Gold in this meeting. You spent all that time trying to get here. Rumple: If I knew how she did it, I would have done it, too. Belle: Why are any of us here? Hook, Regina, Snowing, Elsa: I’m here for Emma. Rumple: I’m spying on you all for the Snow Queen. Henry: I actually have useful information. Everyone agrees Henry’s ice cream intel is good so Charming takes charge and divides them all into search teams. 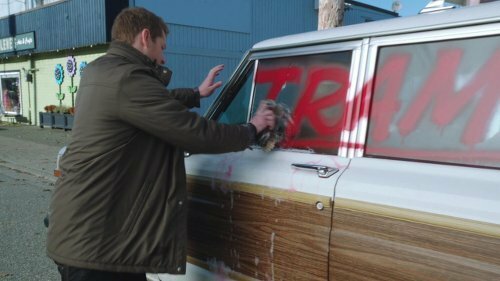 Why is Charming in charge? That is a mystery. Why doesn’t anyone argue with Gold’s assertion that he works best alone (which is clearly code for “if I’m teamed up with Charming he might notice that I’m working against you” which, clearly not since even after all this time they still include Rumple in these meetings despite the fact that he is seriously always working against them – but still)? That is a mystery I will never get over. 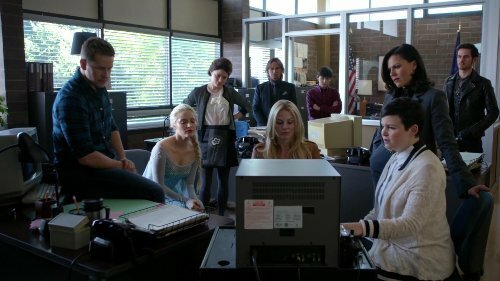 Anyway, Hooked Swan Queen go off to look for the ice cream truck, Belle and Elsa head to the library, Charming sulks because he is partner-less (because I guess Snow has to be Mayor and Henry has to go to school? Idk, but they disappear for the rest of the episode) and Rumple wanders off to warn/threaten the Snow Queen because of course he does. Back in Arendelle of the past Elsa and Anna are reunited. Elsa asks if Anna found out why their parents went to Misthaven and Anna stumbles over the answer because Once Upon a Time is Poor Choices in Communication Theater. 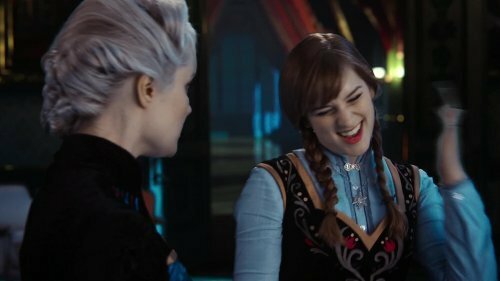 Anna notes that it’s not getting cold and Elsa gleefully explains that she’s learning how to control her powers from their secret surprise aunt, Ingrid. 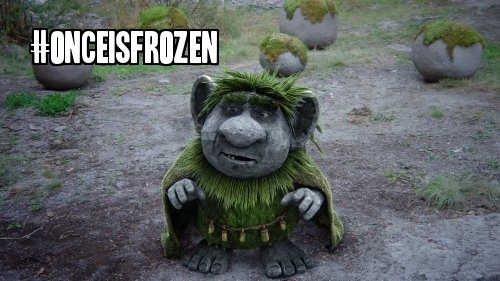 Anna is suspicious and decides to go ask the rock trolls because #OnceisFrozen. Unfortunately for Anna, Auntie Another Snow Queen is a creeper and overhears her talking it over with Kristoff. 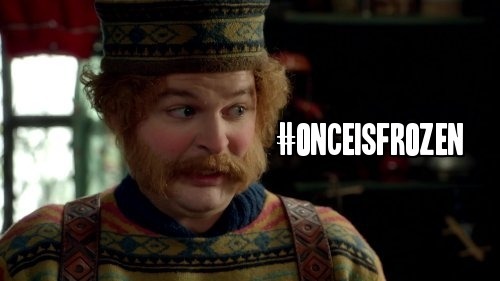 Forward in Storybrooke Forest the Merry Men have found the ice cream truck. Ingrid continues to be a creeper. And Emma continues to be shocked and awed that she has been scrutinized by a succession of evil fairy tale characters for her entire life because destiny. You’d think she’d be used to it by now. All things Elsa would like to know! Why is Belle lying? Is she becoming Mrs. Lying Liar Who Lies? SUGH. Still in the forest Regina/Robin/Marian is the new Snow/David/Kathryn and I hate it. Robin: Are you avoiding me because I told you I love you? Robin: Because I won’t leave my un-dead-sort-of-dead-again-wife for you even though I do love you? Regina: No, look, I don’t know how to say this but I can’t save her, I’ve tried everything I know how to do and nothing worked. Robin: But I believe in you. Because I love you. Regina: You’re not listening. I can’t do it, only you can do it. If you want to save your wife you have to forget about me and find a way to fall in love with her again. I hated this plotline in season one and I hate it now. 1) It requires the audience to root against a marriage which is not necessarily BAD but is kinda ICKY. 2) It requires Robin to be a wishy washy cad who can’t commit to anyone and hurts everyone. 3) There are no good outcomes for Regina. Remember what happened to Snow when she “got between” David and Kathryn’s marriage? The entire town shunned her. And she was the sweet, kind, compassionate school teacher who also volunteered at the hospital! 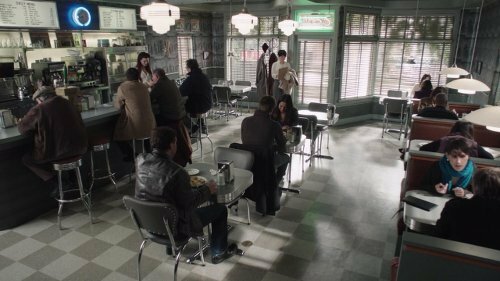 The entire town ALREADY distrusts and dislikes Regina. And don’t get me started with how they all blamed, abused, and ostracized Mary Margaret for daring to have feelings for David but said and did nothing to David, the married man, for reciprocating. RAGE. So yeah, no, I have exactly ZERO interest in revisiting that horrible, awful, stupid, sexist, terrible storyline. But here we are. 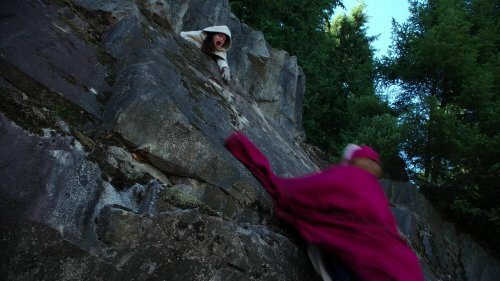 Rumple and Ingrid meet in the woods and talk about leverage and they try to make us think Ingrid actually has the upper hand but it’s laughable since we know Rumple has the all powerful hat and is also Rumple so Idk, I almost fell asleep. – and forward in Storybrooke Rumple and Belle are playing “Who Can Be the Most Sneaky In This Relationship”. You would think Rumple would have this in the bag since he is King of Lies and Manipulation but Belle is making an argument. So, I don’t understand. Why are we supposed to like this relationship? Why are we supposed to like ANY of these relationships? Every romance in this series is based at least partially in emotional manipulation. 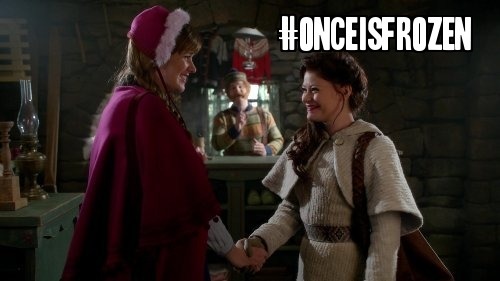 Even Snow and Charming! Last week Snow let a criminal go because she thought Charming set it up as a game. Because lying to her is a thing he does so often, if so innocuously, she thinks it’s cute. And it is, superficially and contextually, cute. But when I line up all the romances and it’s a pattern? It’s a problem. 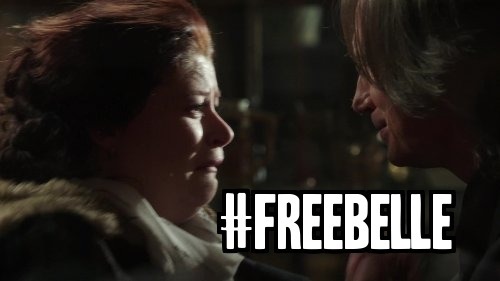 Anyway, Belle commands Rumple to help her and he does because if he doesn’t she’ll realize he gave her a fake dagger. True love, obviously. 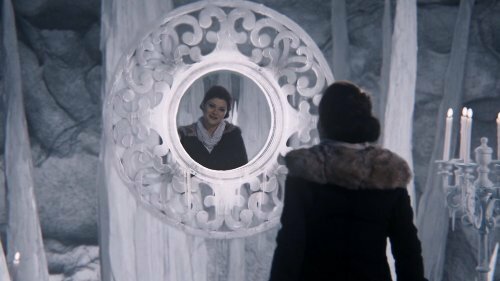 Rumple leads Belle to Igrid’s lair where she finds Ingrid’s mirror and inside it a meaner and truthier version of herself. Thru Mirror Belle we learn the truth: the trolls gave Belle back the memory of her mother’s death in the form of a purple rock she could only use back in Misthaven. 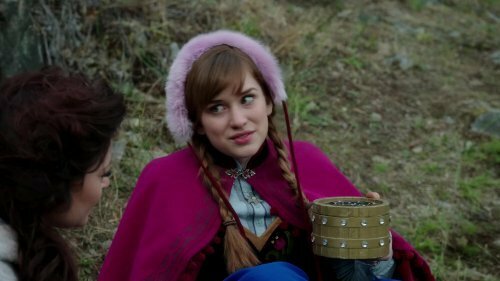 Thus when Ingrid started up a storm to keep Anna from getting back to Elsa with the troll intel about their family (I’ll explain later) and Anna fell off the mountain….Belle tried to save her rock before her friend. So Anna falls down. Ingrid pops in and takes Anna and the all powerful hat away. She locks Anna up and plans to tell Elsa Anna was going to use the hat on her sister just like her parents were going to. Anna should have told Elsa the truth when she had the chance. Belle returns to her father’s castle without the rock but learns the truth anyway from her dad. It would have been a lot simpler if he’d just told her when she asked the first time. Her mother threw herself between the trolls and her daughter and saved Belle’s life. Belle decides to become a hero like her mom (I still say Collette is a collection of ideas and not a character but at least she’s a role model for Belle). 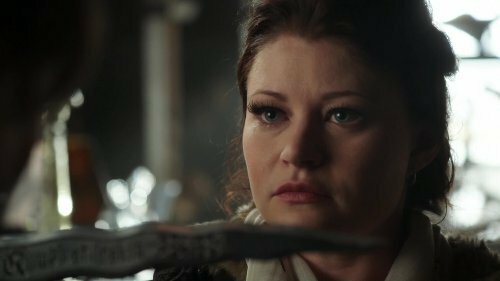 The mirror also tells Belle she knows the dagger is fake and Rumple is a lying liar who lies but when Belle confronts him in his shop, he lies. And she believes him because she is so upset about what she herself is turning into and I agree with her. Back in the Sheriff’s office Elsa found something in the library after all. 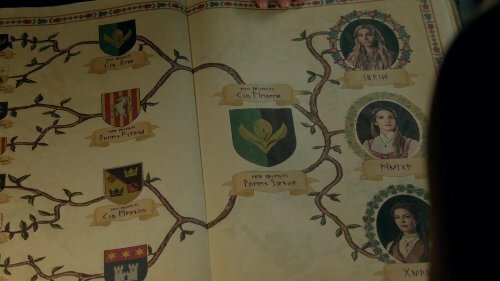 A family tree that lists Ingrid as the eldest of three sisters. The youngest was Elsa and Anna’s mother, Gerda, and the middle sister is a dead ringer for Emma named Helga. On top of that, the prophecy that Emma and Hook found amongst Emma’s grade school paintings (that’s not suspicious at all) speaks of the savior, named Emma, becoming the Snow Queen’s sister. 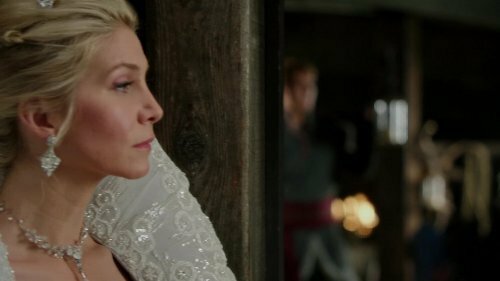 Belle arrives and finally comes clean that she knows Anna, she saw Ingrid capture her and the hat, and she’s seen the mirror that Rumple tells her will unleash a spell on all of Storybrooke and turn everyone against everyone. So that’s Another Snow Queen’s evil plan. Make the Storybrookers murder each other until only Ingrid, Emma, and Elsa – her perfect blond family – remain. And Rumple revisits the leverage conversation to tell Ingrid surprise, he has the hat so he’s ultimately in charge. I’m shocked.